I personally hate talking about the issue of climate change. I think all the dialogue around it has become a joke- just a bunch of regurgitated political talking points and sound-bites. Look, I understand that there is no such thing as “certainty” in science. But what we have is a group of politically and financially motivated people (the oil and gas industry and the mostly conservative politicians in their pockets) who are using a tiny bit of uncertainty as an excuse to ignore a major problem. That isn’t to absolve those who claim to be champions of the climate change debate either. Every year I hear liberal politicians (Obama included) making big promises about passing legislation to slow climate change, and every year I see those politicians forget about their promises once they’ve won their spot in Washington. 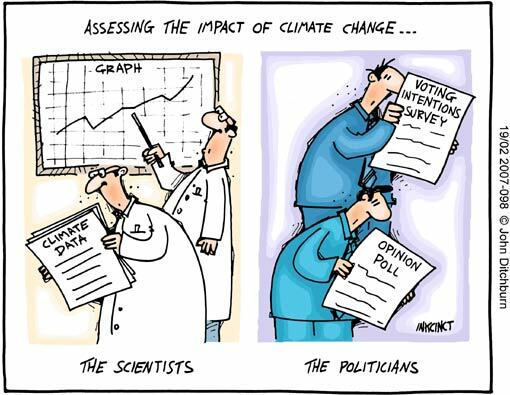 While some of them may be genuinely concerned, it’s my (possibly pessimistic) opinion that most of them use global warming for the votes, just like some conservatives deny it for the votes. I don’t claim to be a climate expert by any means- that’s a claim very few people in this world can make. But when we live in a global, interdependent society, we simply cannot survive without a certain level of trust and respect for the academics who are our experts. Could 99% of climatologists be wrong about climate change? Sure. Could they all be part of some massive conspiracy to tax carbon-emissions? Also possible. But if you took your child to 100 doctors, and 99 of them said the child had a fatal disease, would you believe the one doctor who said the child was fine? Because that’s what we’re doing with our planet right now. Taking real action to battle climate change will cost lots of rich and influential people a lot of their riches and influence, and (in my humble opinion) that is the primary reason why they’re relentlessly trying to convince us to listen to that one dissenting doctor. Why Did the U.S. House Pass An Amendment Barring the Pentagon From Investigating Climate Change? Why Were Canadian Weather Forecasters Just Forbidden to Discuss Climate Change? Easy solution. Solar freaking roadways. Okay, here are my doubts about the theory of climate change. I don’t believe that there is a cohort of people in the world who can predict what the climate is going to be like at any time in the future based on the value (also unpredictable) of one variable, in this case the concentration by volume of carbon dioxide. And in fact none of the climate change predictors foresaw the pause in the rise in global temperatures that has been now been evident for more than a decade. The argument for man-made climate change basically comes down to, all the scientists support the theory, but the fact is, all the scientists who support the theory have been shown to have poor powers of prediction. Consider the East Anglia Climategate email hack. It is clear from the emails that senior climatologists were aware of the pause in global warming and conceded among themselves that the pause confounded the theory of global warming, and it also perfectly clear that they conspired to keep the existence of the pause from becoming public knowledge. They also explicitly discuss ways to punish and silence dissenters from the theory. I mean really, how can you trust these people? The “pause” has actually been debunked — there was never really a pause, it was just that the extra heat was pooling deeper within the ocean than we were measuring. The linked article also talks about how Exxon scientists were aware of a connection between fossil fuels and climate change as early as 1981. Exxon — one of the world’s largest oil companies — has also acknowledged climate change as “a serious global risk” in recent years. I agree that prediction is always difficult, especially with something as complex as the climate, but climatologists also have decades of prior data to examine. They might not be able to tell you definitively what the climate will be like in 20 years, but they can trace rising carbon levels over the past 100 years and show you how the climate has changed during that time period with a pretty high level of accuracy.